What if you can leap tall buildings and defeat alien monsters with your bare hands, but you buy your capes at secondhand stores and have a weakness for kittens? 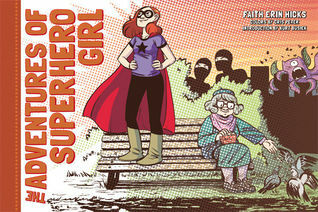 Cartoonist Faith Erin Hicks brings charming humor to the trials and tribulations of a young, female superhero, battling monsters both supernatural and mundane in an all-too-ordinary world. * A lighthearted twist on the superhero genre! Superhero Girl rocks! I giggled my way through this delightful collection of Faith Erin Hicks’s comics. Superhero Girl can jump over tall buildings, throw disgusting alien monsters into outer space, and defeat ninjas with a few well-delivered pows and bams. She also rescues kitties from trees, worries about how to pay the rent, and feels particularly out of place when her roommate drags her to parties. And then there’s her brother Kevin, a chiseled, handsome success of a superhero who has crowds of cheering fans and lots of merchandising value as well. Superhero Girl is just looking to fight crime and do good, but also suffers the challenges and humiliations of being 20-ish and looking to find her place in life. And oh, the horror of wearing her mask on a sunny day but forgetting to put on sunscreen! Or finding herself at a job interview up against King Ninja. Or getting kicked out of college because the university’s insurance won’t cover superhero fights. This is a quick book, but lots of fun. Highly recommended for when you need a break and just want to kick back and enjoy. The drawings are terrific, and Superhero Girl herself is a quirky, flawed, loveable main character — who is super talented when it comes to defeating evil ninjas and helping old ladies cross the street. I’m looking forward to reading more by Faith Erin Hicks! And if you want a recommendation for another of her books, check out my review of Friends With Boys.